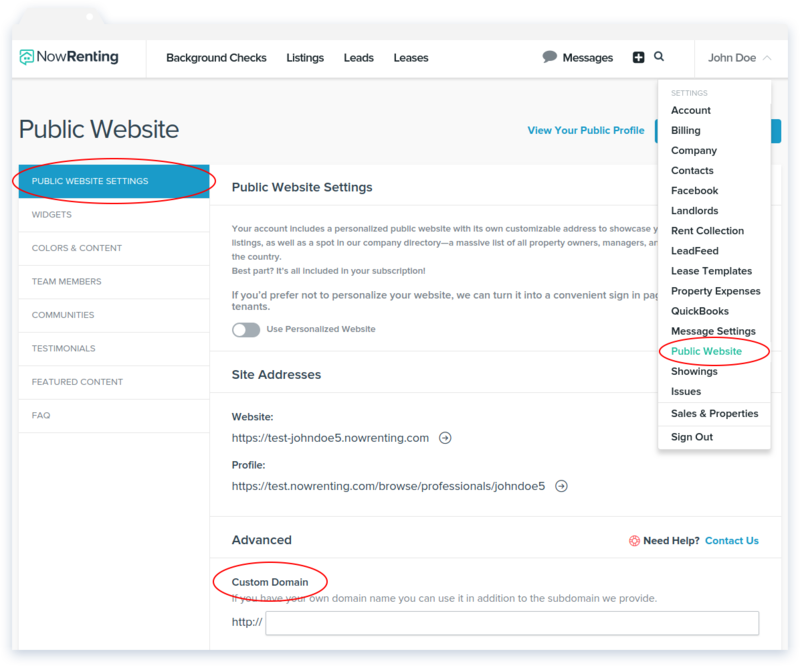 NowRenting’s Public Website allows you to use a custom domain associated with your personal or company website. The instructions differ, depending on whether you’d like to use a subdomain (like listings.mysite.com) or the main domain (like mysite.com). Navigate to Settings > Public Website > Public Website Settings. The custom domain settings can be found under the Advanced heading. Then, you’ll need to edit the DNS settings for your website. If you’re unsure how to do this, contact your webmaster or refer to your web host’s documentation. In your website’s DNS settings: Add a CNAME record for listings.mysite.com with the value: nowrenting.com. Enter the domain in NowRentings Custom Domain field. Like: mysite.com. In your website’s DNS settings: Add an A record for mysite.com with the value: 34.193.75.110. Recommended: If you’d like www.mysite.com to show your NowRenting website as well, create a CNAME record for www.mysite.com with the value: nowrenting.com.